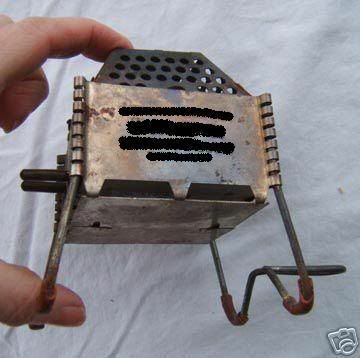 Take a look at this little stove. cute little bugger!!! What kind is it? Zelph, I agree with Oops's assessment of your stove. I don't know the make of your stove but if Oops wants to buy it, you know it has to be "rare" and probably worth "A Borde Bomb" in trade ! That is the First stove made by pyromid. it will burn an hour with 4 pieces of charcoal. it will burn paper , wood grass twigs. Username75 wrote: That is the First stove made by pyromid. Thanks for your insight on the "Marshmallow" stove. I had never seen one before. Stoves fascinate me as does the flames they create. Was it , indeed, called the Marshmallow Stove ?